Imagine pulling your pick-up truck up to the pump at the gas station, and instead of costing $150 to fill up your tank, it costs $75. The comparison is not necessarily that direct, but that is the kind of savings in fuel costs B.C. 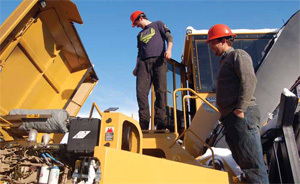 logger Jared Douglas is seeing with his new Tigercat 880 processor. 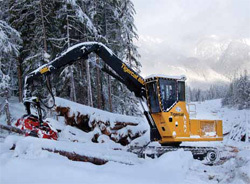 Suncoast Logging’s Tigercat 880 processor was operating in snowy ground near Gold River on the west coast of Vancouver Island earlier this year. 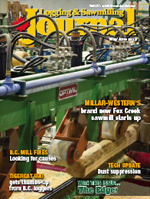 Suncoast Logging harvests primarily for the export market for Western Forest Products. Of course, the cost of diesel has not gone down for Douglas and his company, Suncoast Logging—but the Tigercat 880 is just that much more fuel efficient. The 880 burns about 23 litres an hour, which is about half of what they were consuming with an older machine. And it produces the same amount of wood. The fuel sipping nature of the processor was not the only reason he bought the machine. Douglas is sold on purpose-built forestry machines. And he was sold on the Tigercat 880 machine. B.C. Tigercat dealer, Parker Pacific Equipment, took Douglas on a visit to the Tigercat manufacturing plant in Ontario. He actually saw an 880 unit, though it was still being assembled on the shop floor—and he bought it. So much so that Tigercat sent people out to the Suncoast Logging operation, to talk about the equipment the loggers were working with, what they liked about it, and what they’d liked to see changed. And, he says, how the 880 is designed reflects that they listened carefully. Depending on whether the timber is going to the Chinese or Korean market, and what customer within those markets, the lengths the Tigercat 880 with Waratah head will be cutting to can differ. A sort can change twice in a day, with operator Curtis Teagle cutting one length in the morning and another in the afternoon. 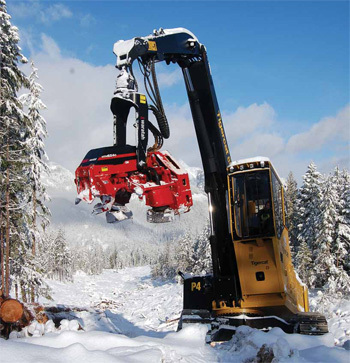 The 880 machine is fairly new, with only a handful of machines out in the woods, including one being used as a loader by Blue Valley Enterprises in B.C.’s Central Interior (see following story). Suncoast has unit #6, and it’s the first machine to be set up as a processor. Some loggers are content to wait until new machines are run through their paces elsewhere before making the commitment themselves. But Douglas has been a trail-blazer before with new equipment, and it has paid off. Four years’ back, he was among the first to purchase Tigercat’s new LH870C self-leveling harvester to handle the steep terrain on the B.C. Coast. He now has 10,000 hours on the 870C harvester. As mentioned, the fuel savings for the 880 processor are substantial. “That’s a big reason for getting the machine right there,” he says. The 880 features a fuel-efficient Cummins QSL9 nine-litre engine which delivers 300 hp, a low speed engine said to be designed for long life and lower fuel consumption. Other features on the 880 include a smooth, quiet, twin swing drive system and a dedicated, energy recovery swing system, whose closed loop drive feeds power back to the engine when swing decelerates, reducing fuel consumption and recovering energy for other machine functions. It has a Tigercat F7-163 heavy duty forestry undercarriage, designed and built to Tigercat specifications for full forest duty. The initial purchase price may be a bit higher, but it is more than made up for in performance and reliability, he believes. They also have a Madill 3800C with a Waratah 626 head, and a 3800C with a T-Mar grapple for hoe chucking. Rounding things out they have a Tigercat 630C skidder, bought used, but with low operating hours on it, and a Cat 568. Operator Curtis Teagle is pretty pleased to be working on the Tigercat 880 processor. The visibility from the cab of the 880 is extremely good, he said, with lots of windows. “It can take a bottle of Windex and roll of paper towels to clean them,” he jokes. The 880 is the first new machine that Teagle has had—“I loved peeling the plastic off the seat.”—and he clearly takes good care of it. That attention extended from the small, such as the radio wiring—essentially the tech person just had to plug the radio in, it was that simple—to the rock guards on the rollers. Douglas pointed out Tigercat production support engineer Fil Rinaldis for praise, for his efforts in making sure they were happy with the 880, and ensuring it was set up to meet their needs. Tigercat dealer Parker Pacific’s attention to detail is also high. Douglas likes the service he receives, and pointed out Peter Goebel from the Parker Pacific shop in Campbell River as being especially helpful. All this attention to detail means that Douglas, operator Curtis Teagle and everyone else on the crew can focus on the job at hand: producing wood. And after a few lacklustre years in the industry, Suncoast Logging is doing a lot of that, primarily for the export market for Western Forest Products. They haul from the different logging sites to the large Western Forest Products log sort just outside of the town of Gold River, on the west coast of Vancouver Island. The new Tigercat 880 machine is helping to keep their overall operation productive and efficient, which is what it is all about these days, says Douglas. “There is no margin for not being efficient and equipment not working,” he says.